Disaster capitalism depends on the idea that "There is No Alternative" and that the populace can only sit by passively while their infrastructure, government, homes and schools are hijacked and sold off to low-bidder corporations to financially engineer and then extract rent from. That's certainly the model that started to play out after Hurricane Maria, when Trumpist cronies were handed sweetheart deals and the people were left to die in droves while captains of industry carved up the loot. 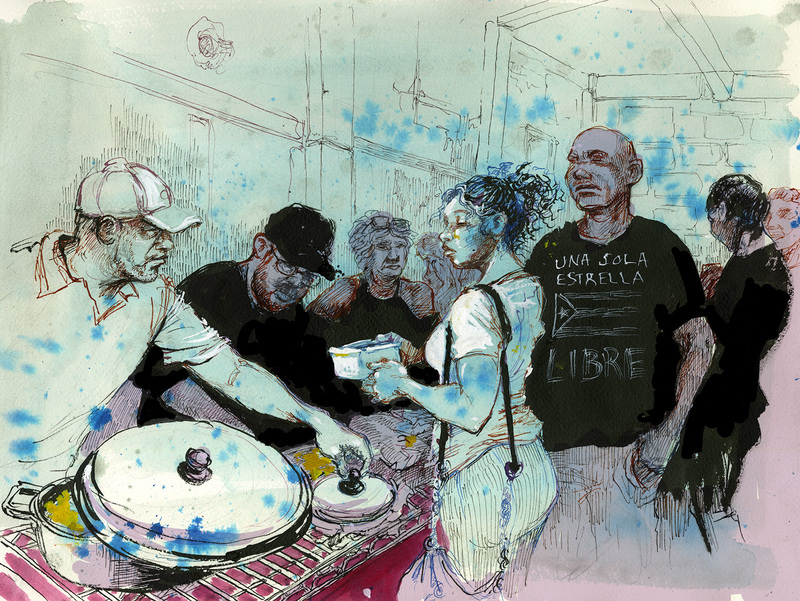 But the populace need not be a flock of sheep waiting passively for the shear: instead, they can rise up and take care of themselves, through systems of solidarity and mutual aid, and that's what's happening in Puerto Rico, where Molly Crabapple reports on the smashing success of anarchists and socialists whose collectives are filling in the humanitarian relief that has been denied to them by Trump's incompetent state and the shareholder firms who are more interested in their bottom lines than the human lives they are being paid to ease. So you've got the radical black feminists of Taller Salud, rebuilding homes in Loíza; Colectiva Feminista en Construcción, handing out "food, supplies, and money for tarps"; there's the punks of Santurce's El Local, feeding 600 people a day from a community kitchen; and many others -- often these groups date back to the incompetent bungling of the Hurricane Irma relief, and have gone from strength to strength, forging ties with the diaspora in Miami and New York, showing people that there is an alternative. Two weeks after Hurricane Maria hit, aid remained a bureaucratic quagmire, mismanaged by FEMA, the FBI, the US military, the laughably corrupt local government. The island looked as if it were stuck somewhere between the nineteenth century and the apocalypse. But leftists, nationalists, socialists—Louisa Capetillo’s sons and daughters—were stepping up to rebuild their communities. Natural disasters have a way of clarifying things. They sweep away once-sturdy delusions, to reveal old treasures and scars.